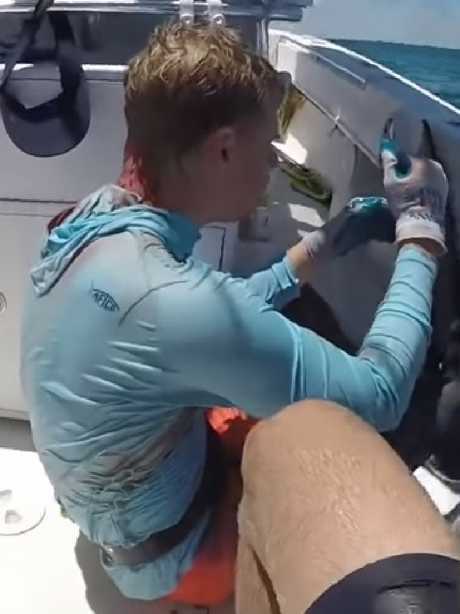 HORROR footage has been released of the moment a man miraculously cheated death after a reef shark viciously attacked him in the Bahamas. 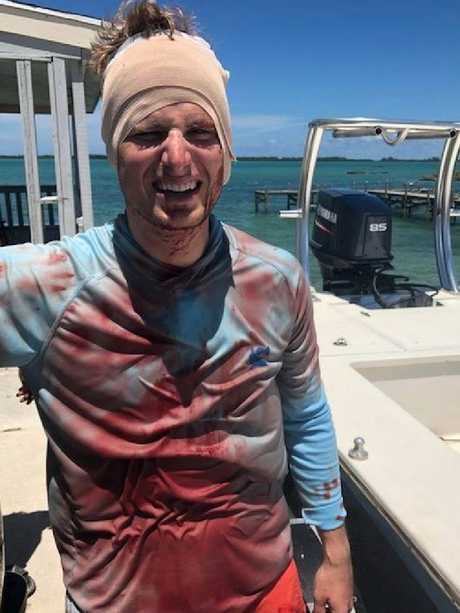 Will Krause, from Greensville, South Carolina, travelled to the Abacos islands, in the northern Bahamas, for a summer spearfishing trip with his mates in late August. About five of the friends dived off the back of their hired boat before Mr Krause began searching the ocean floor, approximately 7.6m below the surface. 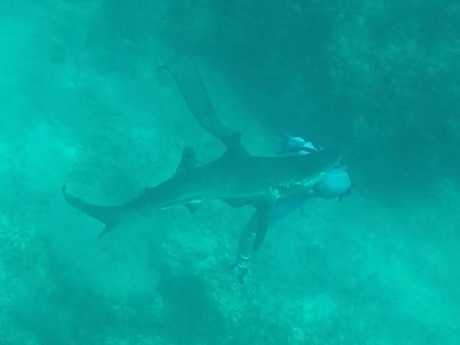 GoPro footage, taken by one of the group, shows Mr Krause's friend spear a section of coral before pulling out a small fish. But as he wrangles with the fish at the end of his spear, a fast moving reef shark swims straight beneath him, approaching an unaware Mr Krause from behind. In a Facebook post to his friends and family, Mr Krause said the 2.1m shark "struck the back of my head and neck" before swimming away. Witnessing the scene close by, Mr Krause's friend immediately swims to the surface of the water and yells to the group "Shark! Shark! Shark!". "Bro, are you all right?" he asks as Mr Krause clutches his bleeding head. 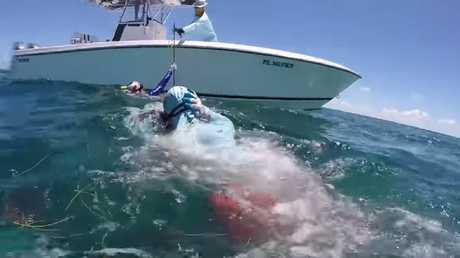 The frantic group can then be seen swimming back to the safety of the boat. In an interview with US morning show, Good Morning America, Mr Krause said that during the attack he could actually hear the "sound of the crunch of my head, which is not a pleasant sound". 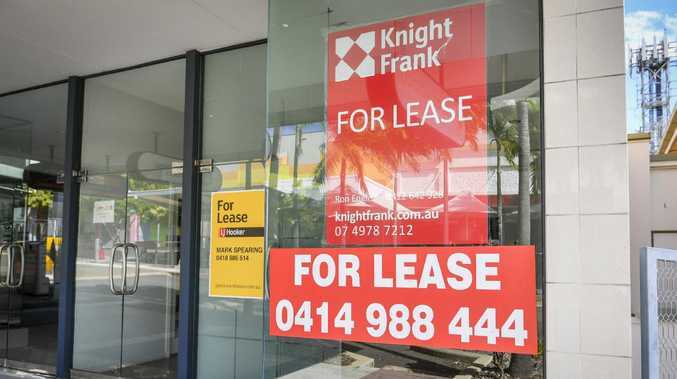 "I was pleading with the Lord: Not right now, not yet," he said. 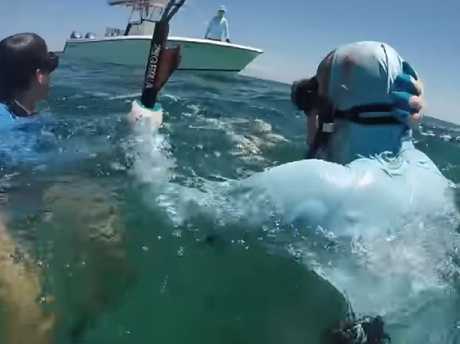 The GoPro footage, uploaded to Youtube this month, has been viewed more than 360,000 times and received hundreds of comments from horrified viewers. The attack left Mr Krause bleeding profusely from his neck. The devout Christian decided to post the video and photos the day after Thanksgiving to say thank you to his friends for helping him as well as God. "I miraculously escaped with several stitches, some gnarly scars, and a viral GoPro video (thanks to Zach Shipps & Stephen Murray)," he wrote. "While encounters like this certainly shift your perspective, it doesn't take a shark attack to recognise God's generosity & intentionality in our lives". Lucky escape: Mr Krause ended up with just a few stitches.